One class of these molecules, colibactins, has been shown to be produced from a gene cluster called the, polyketide synthase island (PKS). PKS occurs in certain strains of Escherichia coli (E-coli) that seem to be prevalent in the microbiota of colorectal cancer (CRC) patients. 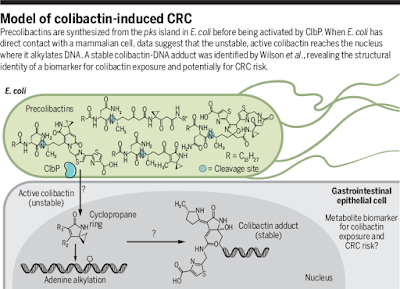 Up until this time, despite many years of painstaking research, little has been discovered regarding the structure and the mode of action of colibactins. In their research Wilson’s group identified the colibactin-DNA adducts as involving the cyclopropane ring and that the site of alkylation involves the nucleotide adenine within the DNA backbone (see diagrams below). Furthermore, it is believed that these adducts could lead to mutations in the oncogenes or tumor suppressor genes that drive CRC-related tumorigenesis. Although, this model of colibactin involvement in DNA modification is significant, many questions remain unanswered in regard to how tumorigenesis is subsequently initiated in CRC. However, it is line of research that offers some promise in elucidating cancer-causing mechanisms.